Just about a year ago, I got an email from Stefan Johnson, the creative director of a design agency in London, who was planning a Kickstarter campaign for a notebook. It stood out to me because, unlike most other Moleskine-style notebooks, this was for a completely customizeable notebook — from the cover to the spine, the elastic band to the bookmark, you could pick the design and the color, and you could do it without being required to order in quantity — each was completely one-off. I was intrigued, so I pledged £10 (disclosure: I pledged at a level that had a discounted rate for bloggers who reviewed the product. And here is that review). The campaign launched on August 18, and closed a couple months later on October about £600 over the £10,000 goal. In addition to this design, I chose a black elastic band, and a red bookmark to accent the red on the cover. That was in mid-August, right after the campaign ended. I heard back from Stefan again in March, apologizing for being silent for seven months, and letting me know my notebook was ready. I responded, and then there was silence again for a couple months, when I heard from someone else from Bookblock — Phoebe — that she was going to send me the notebook. A week later, 10 months after the campaign ended, the notebook came. Well, first of all, the order was wrong. I asked for a black elastic band and a red ribbon, and got a navy blue band and a white ribbon. However, the design itself was implemented from the template with exacting precision. I lined it up so the spine had a pencil right in the center — if it was off even by a fraction of an inch, it would be pretty noticeable. The quality of the printing is… decent. It has the resolution of maybe a nice color laser printer, and although the color is pretty true to the digital design, it was finished with what looks like a clear, matte coating that just dulls the whole design. This is just a guess, but it looks like the design was printed on paper that was applied beneath some kind of contact paper — there are multiple instances where there are bubbles between those layers, especially around edges. It cheapens the looks significantly. Phoebe told me that Monsieur Notebooks was a “sister company” of the Bookblock Original, which looks to mean that they produce the notebook itself — the binding, the paper and the materials. 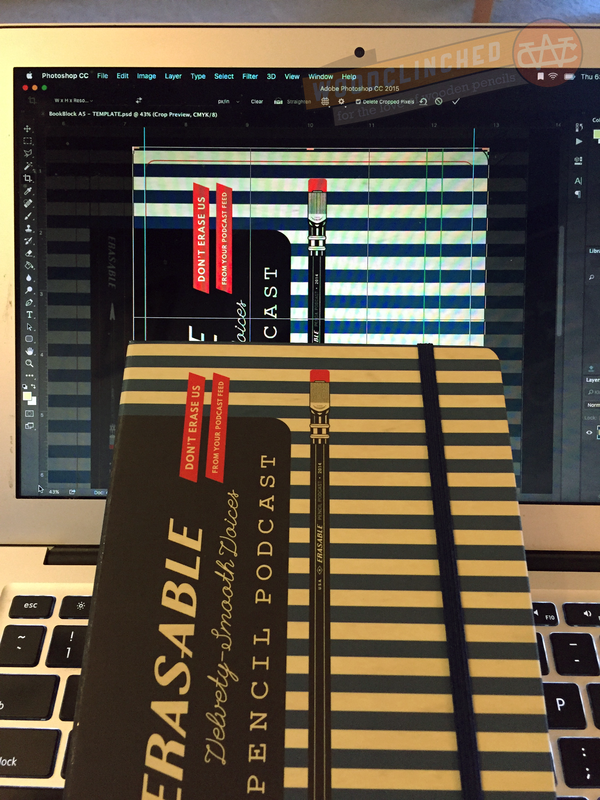 If I were to guess, Bookblock Original wraps their designs around the Monsieur journal. Monsieur’s a pretty popular producer of custom notebooks — if you’ve ever gotten a pretty nice customized journal that seemed nicer than and more personalized than a Moleskine with a stamp on the cover, it could very well have been a Monsieur. The paper inside is really nice. It’s medium-heavy weight, about 90 gsm, and has some tooth to it (but not too much tooth), much like the Baron Fig Confidante. 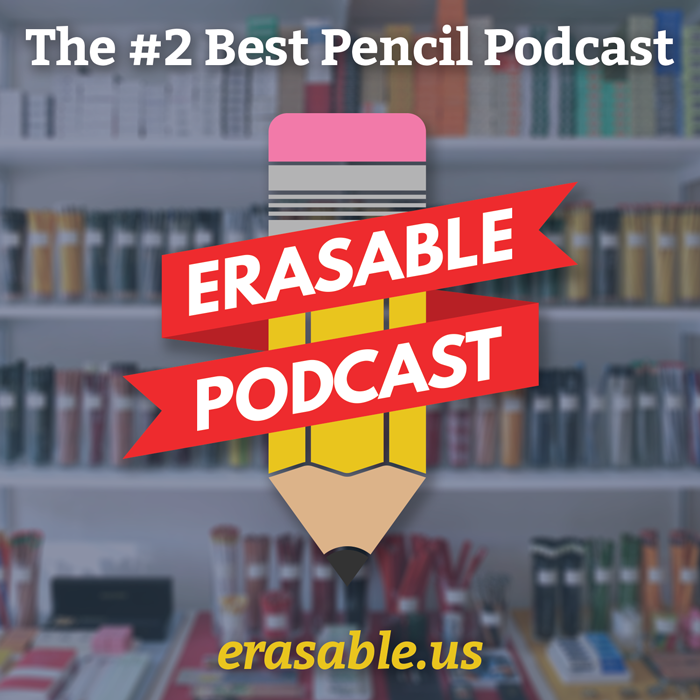 This means it’s pretty pencil-friendly. My General’s Cedar Pointe #1 wrote in it like a dream, smooth but dark. The signatures of the book are visible and are pretty noticeable. I’m not sure what that indicates, but it seems to me to indicate that it’s been hastily assembled. 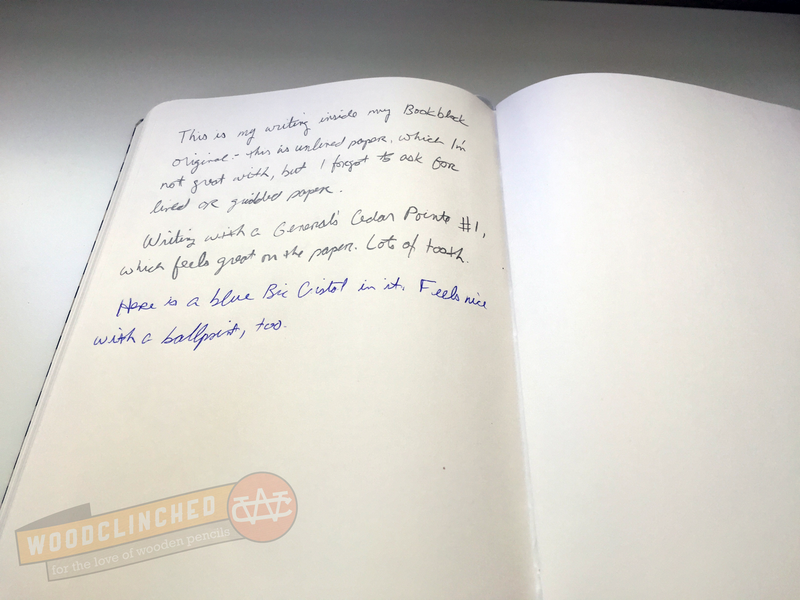 Even most Moleskines, which have dropped in quality over the years, seem to be bound and cut carefully enough that it’s hard to pick out where the signatures in the binding start and end. 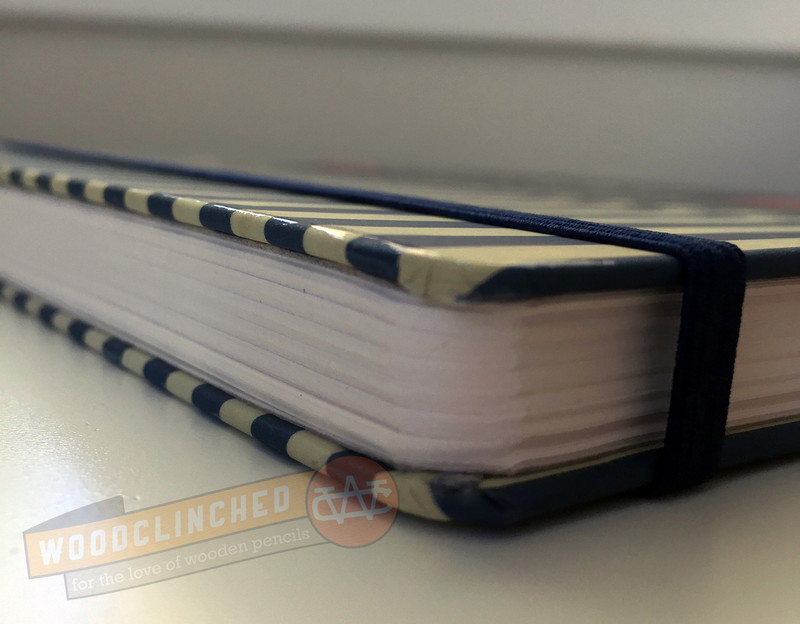 Now that the Kickstarter is over, these notebooks are available publicly. The Bookblock Original’s website says that the notebooks start at $18, though they aren’t clear up front what features cost more until you’ve completed the process to design your own. It’s also unclear what Bookblock Original’s relationship is to Bookblock, or what their relationship is to Monsieur. The original Kickstarter mentioned nothing about differentiating the “Original” from the brand name. 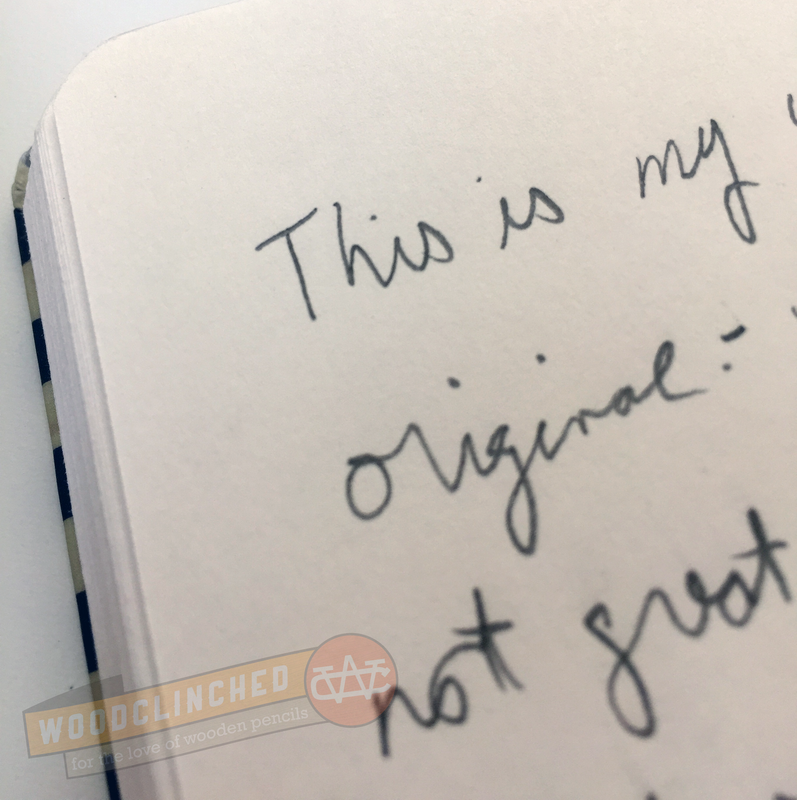 If Bookblock Original improves their production, $18 is a perfectly reasonable price to pay for the amount of customization you’ll be able to do to a reasonable quality notebook. It’s great for one to, say, five notebooks decked out with your favorite design. 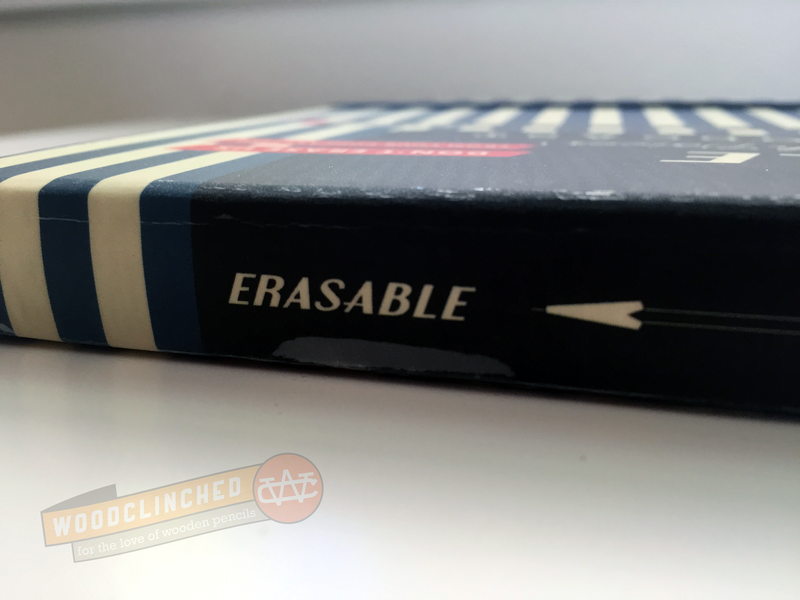 I was hoping to be impressed by this enough to buy Johnny, Tim and TJ all a copy of this Erasable Podcast notebook, but until the dull finish is more vibrant and there are no bubbles in the cover, I don’t think I’ll be spending more money here. Now that they’re in regular production and out of the setup phase, hopefully that’ll be soon. I’ve had an absolutely terrible experience with Bookblock. Stefan provided terrible customer service, was incredibly rude and condescending, and when I received my order and the box was ripped open and nearly all of the books were damaged (dinged, scratched, wrinkled paper). When I reached out to them instead of offering to fix it Stefan tried to shift blame for the ruined order to me and didn’t even offer me a partial refund. When I pushed and asked how he planned to make it right he responded “I have no choice but to refund you the money as there’s not much I can do about your issues now” – Yet I still have not received my refund. I now have $355 worth of trashed notebooks that I cannot use, sell, or honestly even give away as gifts.